Technology has become an increasingly important part of students’ lives beyond school, and even within the classroom it can also help increase their understanding of complex concepts or encourage collaboration among peers. Because of these benefits, current educational practice suggests that teachers implement some form of technology in their classrooms – but many teachers face difficulties in doing so. Cost, access, and time often form considerable barriers to classroom implementation, but another obstacle is a lack of knowledge regarding how technology can best be used to benefit students across diverse subject matter. Punya Mishra and Matthew J. Koehler’s 2006 TPACK framework, which focuses on technological knowledge (TK), pedagogical knowledge (PK), and content knowledge (CK), offers a productive approach to many of the dilemmas that teachers face in implementing educational technology (edtech) in their classrooms. 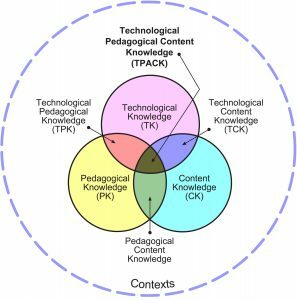 By differentiating among these three types of knowledge, the TPACK framework outlines how content (what is being taught) and pedagogy (how the teacher imparts that content) must form the foundation for any effective edtech integration. This order is important because the technology being implemented must communicate the content and support the pedagogy in order to enhance students’ learning experience. According to the TPACK framework, specific technological tools (hardware, software, applications, associated information literacy practices, etc.) are best used to instruct and guide students toward a better, more robust understanding of the subject matter. The three types of knowledge – TK, PK, and CK – are thus combined and recombined in various ways within the TPACK framework. Technological pedagogical knowledge (TPK) describes relationships and interactions between technological tools and specific pedagogical practices, while pedagogical content knowledge (PCK) describes the same between pedagogical practices and specific learning objectives; finally, technological content knowledge (TCK) describes relationships and intersections among technologies and learning objectives. These triangulated areas then constitute TPACK, which considers the relationships among all three areas and acknowledges that educators are acting within this complex space. Mishra and Koehler, researchers from Michigan State University, developed TPACK in the absence of other sufficient theory to explain or guide effective edtech integration. Since its publication in 2006, TPACK has become one of the leading theories regarding edtech and edtech integration: research and professional development activities both draw from it heavily. However, TPACK has remained such a powerful principle for almost 12 years because the complex constituents described above allow room for a range of specific educational circumstances. Any effective implementation of technology in the classroom requires acknowledgment of the dynamic, transactional relationship among content, pedagogy, and the incoming technology – all within the unique contexts of different schools, classrooms, and cultures. Factors such as the individual educator, the specific grade level, the class demographics, and more will mean that every situation will demand a slightly different approach to edtech integration. No one monolithic combination of content, pedagogy, and edtech will be applicable for every setting, and TPACK leaves room for researchers and practitioners to adapt its framework to different circumstances. This adaptability can be seen in the various intersections and relationships already embodied in the TPACK acronym. Content Knowledge (CK) – This describes teachers’ own knowledge of the subject matter. CK may include knowledge of concepts, theories, evidence, and organizational frameworks within a particular subject matter; it may also include the field’s best practices and established approaches to communicating this information to students. CK will also differ according to discipline and grade level – for example, middle-school science and history classes require less detail and scope than undergraduate or graduate courses, so their various instructors’ CK may differ, or the CK that each class imparts to its students will differ. Pedagogical Knowledge (PK) – This describes teachers’ knowledge of the practices, processes, and methods regarding teaching and learning. As a generic form of knowledge, PK encompasses the purposes, values, and aims of education, and may apply to more specific areas including the understanding of student learning styles, classroom management skills, lesson planning, and assessments. Technological Knowledge (TK) – This describes teachers’ knowledge of, and ability to use, various technologies, technological tools, and associated resources. TK concerns understanding edtech, considering its possibilities for a specific subject area or classroom, learning to recognize when it will assist or impede learning, and continually learning and adapting to new technology offerings. Pedagogical Content Knowledge (PCK) – This describes teachers’ knowledge regarding foundational areas of teaching and learning, including curricula development, student assessment, and reporting results. PCK focuses on promoting learning and on tracing the links among pedagogy and its supportive practices (curriculum, assessment, etc. ), and much like CK, will also differ according to grade level and subject matter. In all cases, though, PCK seeks to improve teaching practices by creating stronger connections between the content and the pedagogy used to communicate it. Technological Content Knowledge (TCK) – This describes teachers’ understanding of how technology and content can both influence and push against each other. TCK involves understanding how the subject matter can be communicated via different edtech offerings, and considering which specific edtech tools might be best suited for specific subject matters or classrooms. Technological Pedagogical Knowledge (TPK) – This describes teachers’ understanding of how particular technologies can change both the teaching and learning experiences by introducing new pedagogical affordances and constraints. Another aspect of TPK concerns understanding how such tools can be deployed alongside pedagogy in ways that are appropriate to the discipline and the development of the lesson at hand. educational technology can be used in tandem with students’ existing knowledge, helping them either strengthen prior epistemologies or develop new ones. Because it considers the different types of knowledge needed and how teachers themselves could cultivate this knowledge, the TPACK framework thus becomes a productive way to consider how teachers could integrate educational technology into the classroom. Then too, TPACK can also serve as a measurement of instructor knowledge, potentially impacting both training and professional development offerings for teachers at all levels of experience. Finally, the TPACK framework is useful for the ways in which it explicates the types of knowledge most needed in order to make technology integration successful in the classroom. Teachers need not even be familiar with the entire TPACK framework as such in order to benefit from it: they simply need to understand that instructional practices are best shaped by content-driven, pedagogically-sound, and technologically-forward thinking knowledge.